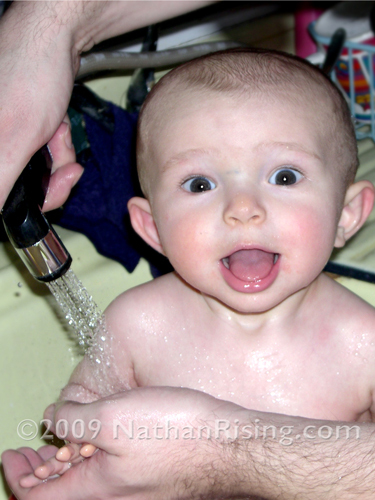 Nathan had his first bath the other day! Ok, before you start wondering if we’ve ever bathed our kid, Paul always just took him in the shower with him and just bathed him in there. It was fast. It was simple. It was less messy. And Nathan really enjoyed it. So the whole reason we had to give him an actual bath was because Nathan (believe it or not!) actually SLEPT during his nap. He didn’t keep himself awake by talking to himself or thumping his legs. He actually fell asleep right away. He slept solidly for two hours. So, do you remember how I told you guys that Nathan was such a stubborn little guy that he was holding in his poop, and making himself painfully constipated because of it? Well, the doctor prescribed some medicine to help with that. I had given it to Nathan hours earlier, but he hadn’t pooped yet. He pooped during his nap instead. And boy, did he ever poop. Remember the MEGA POOP? The poopage that got all into the feet of his sleeper and the grossness of it made me gag? And remember how I said that no poop could possibly, POSSIBLY, be worse than the MEGA POOP? Oh, was I ever wrong. This poop, guys… this poop was WORSE. It didn’t seep into the legs of his sleepers. It did something even grosser. IT SHOT OUT THE BACK OF HIS DIAPER. It soaked through his onesie. It soaked through his crib sheet. Rank, stinky, vile, no-longer-constipated Nathan Poop was all over the place. And when I took off his onesie, there was poop CAKED ONTO HIS SKIN. I had to peel it off his back. I. HAD. TO. PEEL. IT. OFF. And the smell, oh Lord the smell. His onesie was ruined. I have never been one to just throw clothes away. I usually go through great lengths to get stains out, and I have this special routine of soaking, coating with stain-removers, and washing that gets the stain out every single time. But this time, this time I wasn’t going to EVEN go through that. So after I PEELED the poop off of Nathan’s back, I wiped him down with a wet wipe. But wet wipes ain’t got crap on… well… crap. After about 10 wet wipes, his back was still stained with this gross, brown poop color. Nathan needed a shower immediately, and Paul wasn’t able to get in the shower. So we decided that Nathan was big enough to take his first bath. We filled up the sink with water and added some suds to make a gentle bubble bath. At first, he was a little bothered by it all. But Paul gently cleaned him with the sprayer, and Nathan was cool after that. 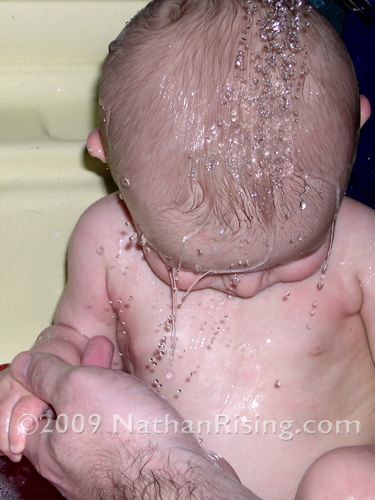 In fact, he really loved watching the water cascading down his head. He watched intently as it made tiny splashes in his little pool of water, looking up at us every so often as if to say So this is what I’ve been missing? Nathan and his monster poops. I still have years left of this, don’t I? ?